Natuzzi Editions Encore all Electric Reclining Modular Cinema Sofa. A Natuzzi Editions architectural masterpiece with fantastic details offer undeniable style and comfort. Large seat and back cushions offer platinum level comfort. This contemporary leather sectional cinema sofa will be the perfect addition to your living room or family room. With plenty of space for everyone, your friends and family will love gathering on this sofa sectional to watch a movie together, catch the big game or just hang out. The seat provide extra stretch-out-and-relax room, perfect for watching movies or catching a snooze, reading a book or just curling up and relaxing. The pillow padded track arms offer extra coziness, and the adjustable headrests can be propped up or down depending on your desired level of support. Wooden block legs support this reclining sectional. Add, remove or rearrange sectional components to make this sofa fit your space perfectly. Upholstered in soft black craftsman hard wearing Italian leather. This suite is made of 6 Modular pieces which can be rearranged to fit your room accordingly. All seats have whisper quiet power reclining actions. Measurements are 404cm width and depth 100cm. 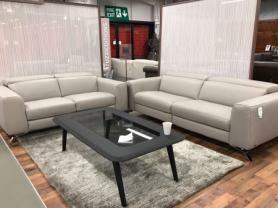 As all the pieces are modular this sofa can be purchased in larger or smaller combinations - ring or email for a quote. This fantastic cinema suite with cinema seating will enhance any home cinema set up.